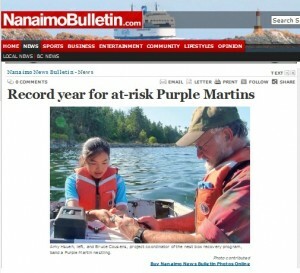 The Nanaimo News Bulletin in BC Canada featured another article on our Western purple martins a few days ago. It’s hard to believe that the season is still winding down for our Canadian neighbors. As the final day of summer approaches, it’s almost a “last hurrah” of sorts for us here in the extreme Southern range of the Eastern species. It is nice to hear that despite the poor weather they still managed to have a good year and some 585 pairs that managed to produce some 2,200 baby martins. 110 of those pairs within the Nanaimo area itself. Of course you can read the entire article by clicking on the picture or visit www.georgiabasin.ca or www.saveourmartins.org. Texas Heat Explains Purple Martin Landlord Woes? All of the data that NOAA has accumulated seems to explain the record complaints of purple martin landlords, not only in Texas but in many States. Nestlings starving from drought, record heat causing nest fatalities and “jumpers”. Even Florida, Louisiana and South Carolina all experienced their warmest March-August recorded yet. Though Texas has not exceeded its record of the length of drought conditions, already the severity exceed those of the 1930′s “Dust Bowl”. Unfortunately, nothing can be done about the weather, except perhaps, to wait it out. Taking the few steps we recommend to help your martins can perhaps help you to feel less helpless but even those steps can only help so much. Things like making sure your martin houses are well ventilated, using purple martin houses that utilize larger nest compartments and perhaps installing a misting system, are the only things that can help. So until next year, pray for more accommodating weather.